Master your midweek meals with this Paella with Smoked Paprika Rice. This rice dish stays true to its Mediterranean-inspired heritage. Impress your tastebuds (and everyone else’s) by simply adding chorizo, prawns and red capsicum for that authentic paella experience. Rice (78%), vegatables [onion (powder, pieces), tomato powder, capsicum, green peas, garlic powder], maltodextrin, smoked paprika^(2%), sugar, natural flavours (contain milk), salt, corn starch, parsley, sunflower oil, yeast extract, natural colour (turmeric), cumin, chilli. ^From responsibly grown smoked paprika. Contains naturally occurring glutamates. Allergens:Contains milk products. Blended on equipment that also processes products containing wheat, soybean, peanut, egg, sesame, fish and crustacea. Stove Top-for best results 1) Bring 1 1/2 cups (375ml) hot water, 1 teaspoon vegetable oil and Rice pack contents to the boil,stirring. 2) Simmer, covered for 15 minutes, stirring regularly until all rice is cooked.Remove from heat,stir, replace lid and stand for 2 minutes before serving. Microwave(900W) - cooking times may vary 1) Combine 2 1/4 cups(560ml) hot water, 1 teaspoon vegetable oil and Rice pack contents in a microwave safe bowl. 2) Cover and cook on HIGH for 15-16 minutes, stirring 2-3 times. Stir and stand for 2 minutes before serving. FOR A COMPLETE MEAL... For an authentic Spanish Paella stir through some cooked prawns, chargrilled zucchini and sprinkle with grated lemon rind and chopped parsley. Hi, sorry to break it to you but this has been deleted from the range. Thanks for your lovely feedback. Sadly this product has been deleted & is no longer available for sale. I have just read that This product has been deleted. I cant believe that such a good producT didnt sell! 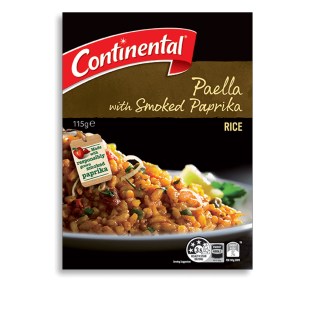 I agree with other reviewers that the flavour was as Good as any authentic paella . If you sold Through your website and promoted it would sell! AbsoluTelY delicious and so flavoursome. A favourite wIth with my family especially as a sidedish with steak. Hi, we are very sorry to hear that this product deletion has caused such sadness, this was certainly not our intention! We will pass your request through to our marketing team. Sorry to disappoint you, but this product has been deleted from our Continental range. Sorry Jo, but this product has been deleted from the range due to poor sales & low distribution. This was our favourite. So dissapointed it is now unavailable. The best paella ive had in a long tIme. Very dis that contine is deleted many ranges from stores. Maybe if you sell in storE have an online option here for people that love your produCts!